Here’s another batch of shows this weekend, spilling into next week. Friday 1/27 – Whiskerman at the Red Devil Lounge in San Francisco. W/ featherwitch, Hummingbird Theater. 9:00, 21+ $15-20. Sunday 1/29 Whiskerman at Rasputins in Berkeley. 2:00 (though probably a little later since I’ll be running over from the Musical offering.) all ages, free. Monday 1/30 La Dee Da at the Revolution Cafe in San Francisco. Part of Classical Revolution Night. 8:00, 21+?, donation. Tuesday 1/31 So at the Stork Club in Oakland. 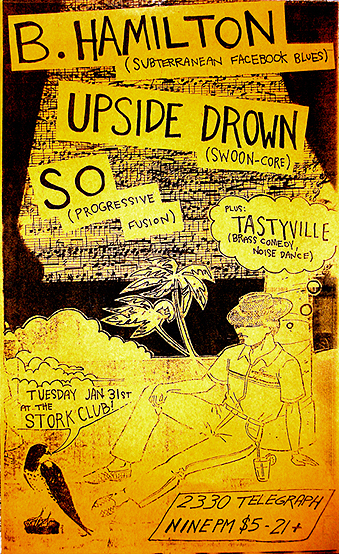 W/ B. Hamilton, Upside Drown, and Tastyville. 9:00, 21+, $5. That’s it for January! More shows next week with the Maddy Band, Devotionals, and Town Quartet. your blog. I as well am an aspiring blog writer but I’m still new to everything. Do you have any points for beginner blog writers? I’d really appreciate it. Wow I’m surprised anyone would ask me considering it took me months to get back to you! Tips? I like to keep it simple and honest. Good luck ultrasounding!